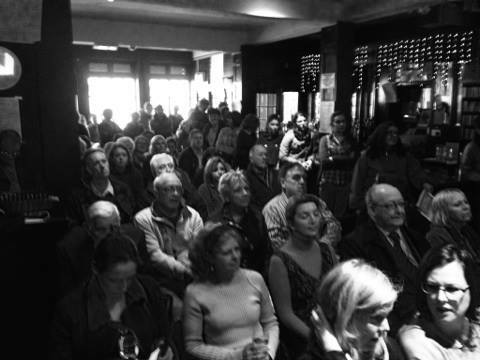 On Saturday (April 26) a very interesting meeting took place in the Cobblestone pub in Smithfield Dublin. The meeting marked the 100th anniversary of the founding of Cumann na mBan and was addressed by Dr. Mary McAuliffe, a lecturer in Irish Women’s History at UCD and is President of the Irish Women’s History Association. The room was packed out, with standing room only for some attendees. Dr MacAuliffe discussd the founding of Cumann na mBan, on 2nd April 1914 in Wynn’s Hotel, Abbey Street, attended by approximately 100 women. She explored the role women played in the national liberation movement, the debates that emerged regarding that role, and the nature of Cumann na mBan’s relationship with the wider women’s suffrage movement. The participants at the meeting contributed to a lively Q&A session. The meeting was organised by the Stoneybatter and Smithfield Peoples History Project. The talk was recorded and a video will be put up on Youtube in a few days. At one stage the torture and murder of political activists in police custody was cause for outrage. Steve Biko’s murder in police custody is but one example. But in our time the torture and death, whether of terrorists so named or innocents and whether in custody or by drone is an image of ugliness that the state actively projects. This image production can be traced to the condition of the political sublime. The notion of the sublime has its origins in the writings of the anonymous author Longinus, who was a Greek teacher of rhetoric and literary critic who lived somewhere between the First and Third Century AD. In his treatise On the Sublime Longinus broadly argued that the sublime is an overwhelming energy source of power and strength. Since the 18th century the notion of the sublime is often associated for us in the first place with its analysis by Immanuel Kant who in his Critique of Judgement used as examples of the sublime images of the Swiss mountains and sea tempests. For Kant the sublime may be terrifying and perilous or it may be something so complex that an inability to form a clear concept leads to an imbalance between thought and experience. As a result the self is made aware of indeterminacy. These perilous and traumatic catastrophes slacken off the grasp of reason, or at any rate they are incompatible with rational knowledge. At one and the same time both enrapturing as well as devastating it is not hard to detect in the sublime the presence of the death drive and to vicariously indulge our fantasies of immortality. Standing before a painting, confronted with the vista of raging oceans which cannot drown us or mountains from which we cannot plummet down because they are no more than pigment on canvas, we can know the pleasure of defeating death. Simultaneously we are able to live out a kind of virtual death by experiencing our destruction rather than its real destructible end. In this way the sublime is both self affirmative and self destructive. Irish Workers Group member Frank Keane carrying the Irish tricolour, Dublin Republican activist from the 1950s-60s Eamonn Nolan carrying the Starry Plough. Butch Roche, who threw a cannister of CS gas into the chamber of the House of Commons in 1970, behind Keane holding the banner. 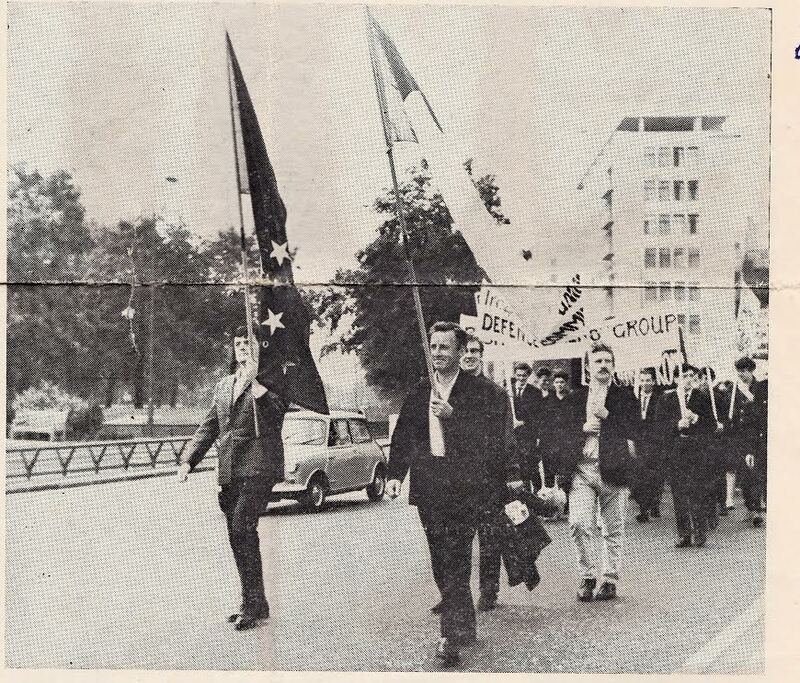 On the 21st August 1966 about 350 Irish exiles and rank-and-file British labour movement activists took part in an Irish Trade Union Defence Committee demonstration against the Irish Government’s anti-trade union legislation. The then Lemass government proposal that a strike could not be deemed official until a secret ballot was held and strike action agreed to by sixty-one per cent of voting members. The demonstration rallied at Hyde Park and marched to the Irish Embassy in Grosvenor Place where a picket was held. Speakers were Eamonn McCann, Michael Farrell, Liam Daltun and John Palmer. What’s behind the attack on Newbridge Credit Union?